Netbackup Bare Metal Restore with Ovirt Tools. Are your’e PCIe card running at full speed ? Netbackup and the ACSLS firewall feature. 3 X.Org X11 libXext runtime library are missing. If diskpool is in up state, and the command above works, but backup fails with status 2074, check the OST credentials configured with tpconfig. The Cayalyst debug log in /usr/openv/hpe/ost/logs will contain lines with “OSCLT_ERR_PERMISSION_DENIED”. Netbackup initial store TIR (True Image Restore) data in the catalog, but not longer than “Keep true Image restoration (TIR) information” setting in the master server properties. After that period of time TIR data is pruned from the catalog. If Netbackup need older TIR data than the prune setting, e.g. for a bare metal restore (BMR), TIR data is restored from media. This can be seen as an additional restore job during BMR. Once thing to note is that both client and master server is the same host. Netbackup Bare Metal Restore has a issue with KVM Ovirt tools version 62.73.104.11700 (latest version as time for writing). On systems where Ovirt Tools has been upgraded, a BMR restore will result in the message : “The restore has stopped due to the following error: Unable to make Registry modification required to boot the system”. The message appear after all data disk has been restored, just before the system needs rebooting. To fix the issue, revert to Ovirt tools 62.72.104.10200 – this version is as time of writing the latest stable version. Performing a Bare Metal Restores (BMR) on KVM virtual machines work seaming less for Windows 2008, 2008 R2 & 2012 using the bootable CD/DVD option. Both the Red Hat VirtIO Ethernet & SCSI drivers are detected by Netbackup and do not need to be manual injected. 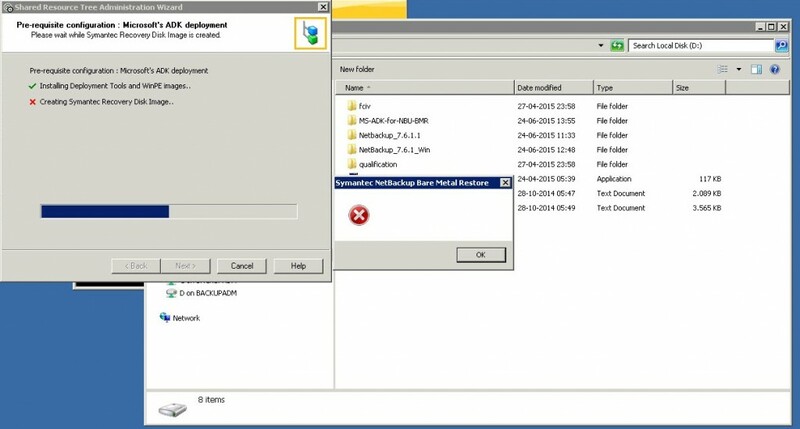 From Netbackup 7.7.x certificates are issues to all connecting Java admin consoles. That is not a bad thing as this tighten up security, however if the systems domain name changes internally e.g. from srv to srv.acme.com the stored certificate doesn’t match and you will get a logon error. 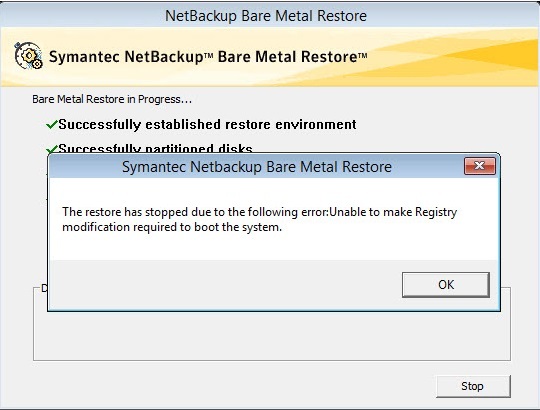 Creating Symantec Recovery disk image (srt) fails using Netbackup Bare Metal Restore option. Cause: McAfee is interfering with the dism commad which Netbackup uses. Or Install VirusScan Enterprise 8.8 Patch 5. [INF] *** Congratulations! The conversion has finished successfully! The bplist is a handy tool for the Netbackup admin to list files and folders , however it’s pretty picky with it’s arguments. The cause is bplist assumptions. if no start time is specified , bplist searches 12 hours back. if no type (-t) is specified standard is assumed (type 0). Specify a start time unless you know the backup is younger than 12 hour. Always specify the -R option. Specify a type (-t) unless you are listing UNIX type backup. YES, the / as path actual work. You can substitute the / with a drive letter, but you must use drive letter in upper case. # bplist -B -C host.acme.com -t 13 -l -R -s 06/07/2010 /c/ WRONG !! Since UNIX system uses type 0 (Standard) you can omit the -t option. As a service, a list of the Netbackup types (Source: Symantec Tech note TECH27299). Use the Netbackup types jointly with bplist -t option. 9	MS-Windows	Not active, use MS-Windows-NT (13) for Windows 2000/NT/XP/2003 clients. 23	DFS	Not an active policy type. 26	NCR-Teradata	No longer supported, contact NCR to see if they provide an extension. 33	Macintosh	Not active, use Standard (0) for Macintosh OSX clients. Restore using the classic “system overwrite” method does not show the error message. Remove the files on the exclude list. A new backup is required to have a “working” BMR backup.